Quality nut butters are delicious, but they can be quite expensive. Find out how to make your own homemade nut butters. It's a super simple way to stretch your healthy eating budget. Am I crazy? Maybe, but it sure helps us save money. One of our favorite things to make is homemade nut butter. Nut butters and seed butters are great spread on things like my Gluten-Free Drop Biscuits or Gluten-Free Wraps. Or eaten on a spoon. A large spoon :-). 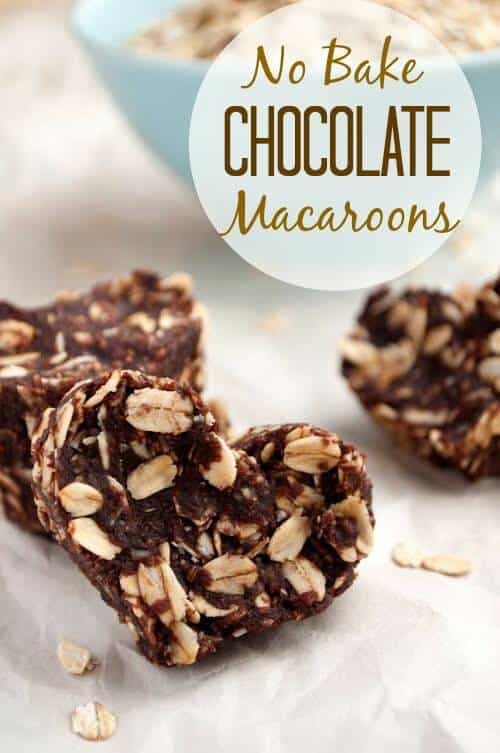 I use butters in my Almond Butter Truffles and I soon hope to post a Cookie Dough Truffle that we love !!! 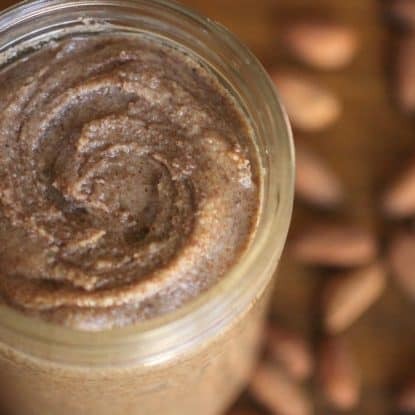 But until you've made your own Homemade Nut Butter (whether it's almond, pecan, or any of those other butters), you really haven't tasted anything yet. The store bought butters are a fortune. And not a small one. It's horrid. So do yourself a favor. For flavor and frugality. Learn how to make homemade nut butter–you'll thank me. 2. Making your own butters from seeds and nuts that are soaked and dried in a dehydrator is better still. 3. 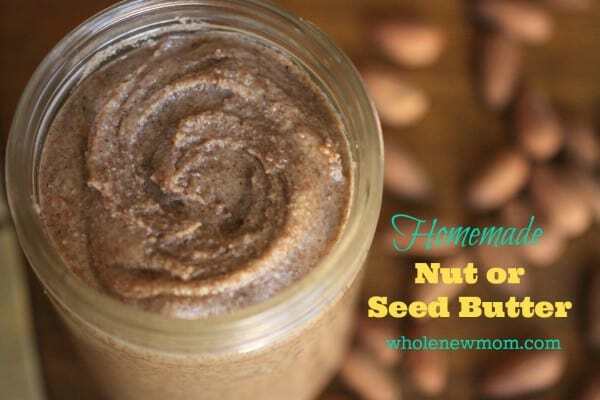 The healthiest nut and seed butter is made by purchasing organic seeds and/or nuts and then grinding them into butter yourself. But that gets pricey. Here's what I do. We do purchase organic sunflower seeds, but most of our other nuts (macadamias, pumpkin seeds, walnuts, hazelnuts, pecans) are all conventional. We haven't chosen to spend our money on going organic with all of these items at this time. We can only do so much. There are other methods for making the butters, but I don't think you can match the Vitamix for consistency, convenience and speed. I know some of you like other blenders, but for me, Vitamix is the answer. I'd love to hear if anyone has success otherwise, however. I've read about using a food processor to make nut butters, but I heard from another reader who was trying to make almond butter in her Viking Food Processor (the same one that I have :-)) and it wasn't working. I've read many similar comments on the internet as well. When it does work, it usually takes 13-15 minutes. Compare that to about 2 minutes in the Vitamix. That's one reason I'm sold on this machine. UPDATE: I am currently test driving the Blend-Tec as well. Hopefully I'll have an update soon but Vitamix has a new model too. 1. To save on cleaning time, I typically make 2 batches of nut or seed butter at a time and sometimes more. That way I only have to clean the blender container out once. You know – I love to cook, but the clean up part? Not so much. After you are done making the homemade nut butter, fill your blender up with about 3-5 cups of clean water. Then turn the blender on high speed and let it run for about 1 minute. The result: Dairy-free Nut or seed milk (great for those with food allergies) that you can use in your tea, coffee (or coffee substitute), or for baking as you wish! It won't be as thick as regular nut or seed milk, but if you wish to add some more nuts/seeds you can. Then blend for about 1 1/2 minutes. Have you seen the prices on almond milk in the grocery store??? You just saved about $2.50! Fresh ground almond butter, peanut butter, and for those of you with peanut allergies who have been buying Sunbutter, have you looked at the price of that stuff? – $30 for 6 pounds on Amazon?! I get organic sunflower seeds for about $1.50 per pound. That's some serious savings. Add some natural sweetener to the blender and make your own. You can substitute nut and seed butters pretty freely in recipes. There will be some texture changes, but I am not a recipe purist I started out trying to be one, but my stress level benefits when I realize that — newsflash — I am not perfect. I do the best I can. When you make the butters in the Vitamix, you may find it necessary to, add a bit of liquid oil (I prefer mild flavored olive) to the blender in order to facilitate blending. I don't typically find this necessary, but pumpkin seeds and almonds tend to be quite dry. In addition to making your own nut or seed butters, you might like to try some of the following money-saving recipes. You can substitute any healthy sweetener for the xylitol. The salt is optional, but tastes great in the homemade nut butter. 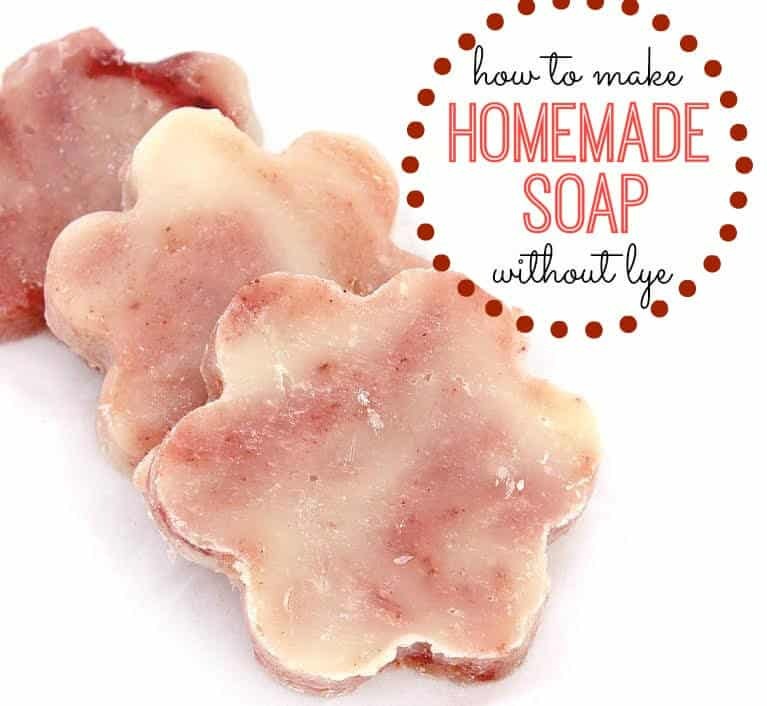 If you used salt to soak and dry your nuts, you might wish to omit this. How to easily make your own Homemade Nut Butter and Seed Butter--fresher than store bought and a great way to save money too! If needed, add a little mild oil to the nuts to assist in blending. Process the nuts or seeds according the manufacturer's instructions. If you are working with a food processor, simply put all of your ingredients into the bowl of your processor and start mixing. Keep it going for up to 12-15 minutes. You will need to stop occasionally to push the mixture down off the sides of the bowl, and you may need to add liquid oil, but you will supposedly end up with a butter at the end. What kind of homemade nut butter or seed butter would you make first? So is there any way to remove the PPO without resorting to hiring a chemist? Probably not. So then, how would I find an almond buying group? There are some saying that the PPO residue isn’t there. I prefer to buy my nuts with no added PPO. 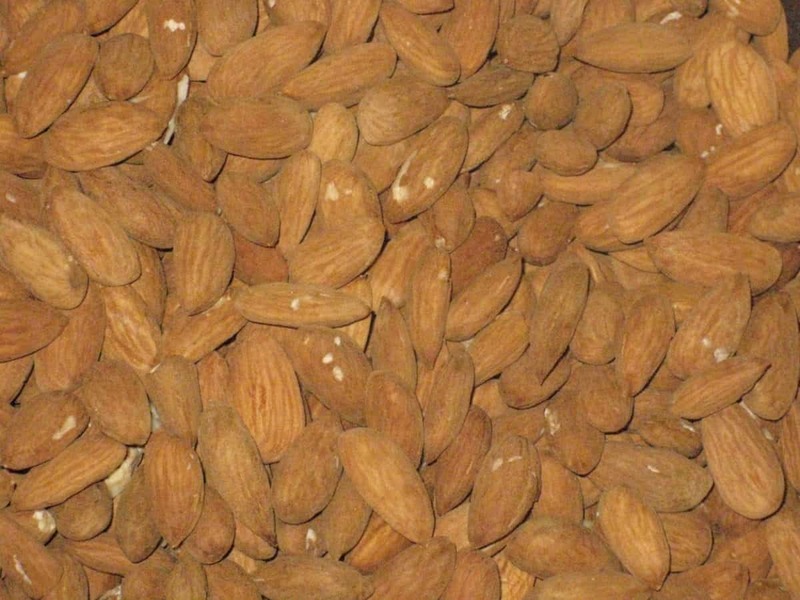 If I soak almonds, do I have to dehydrate them before making almond butter? Great information by the way! Hi there. Thanks for the kind words! Yes, you do have to. It will be very weird otherwise!